The course is a very good one Particularly never attended a well organised coordinated a programme as this one. Everything about this programme is perfect and we feel very honoured.Everything is very good and nothing was our problem. Everything was taken care. I ones again thank the Indian government generosity. Special thanks also goes to the foreign affairs Ministry to the Management and staff of Central Institute for Rural Electrification. Helped me remember most of the theoretical knowledge. Cleared Most of the questions /challenges I was facing in the field in operation of equipment considering that am a monitoring Engineer I always have to be excepted with a lot of knowledge so that I am able to advice technically the Distribution companies under my opinion and company as a whole . The course has equipped me with a lot of knowledge. This course has been of great importance to me as it has broadest my knowledge. The knowledge I got will be benefits not only to my company but to my country at large. I have enjoyed my stay as I visited many places in India including Tajmahal. I made new friends from different countries. 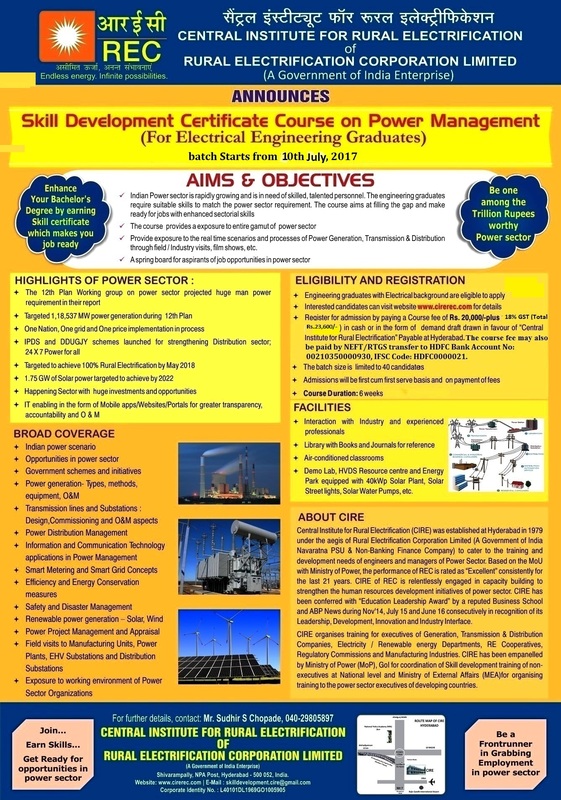 The course can only be described as a bumper package or solar power generation as all aspects were thoroughly covered. The lecturers were very eager and passionate about transferring their knowledge. My stay in India was absolutely brilliant and 1 look forward to returning in the future. For me the course was really interesting with our international friends our faculties who puts more efforts in covering all the topics. We learned more information about the new technologies used in SCADA etc. Learned how to leave a map using GIS system GPS system at NIRD. We visited various sightseeing also. The course has been a Fruitful experience. It allows participants from electrical IT communication background to get a general knowledge in other fields to know about technologies being used in the power sector in India. Stay in India has been good 5 weeks have elapsed quickly.